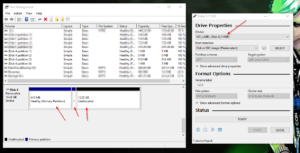 You are here:Home » Tutorials » Sysadmin » Repair USB Stick on Windows 10: Fast & Easy! Repair USB Stick on Windows 10: Fast & Easy! If you find yourself in the situation where your USB Drive all of a sudden shows only tiny amounts of space, or even multiple partitions at once, don’t toss the thing away. 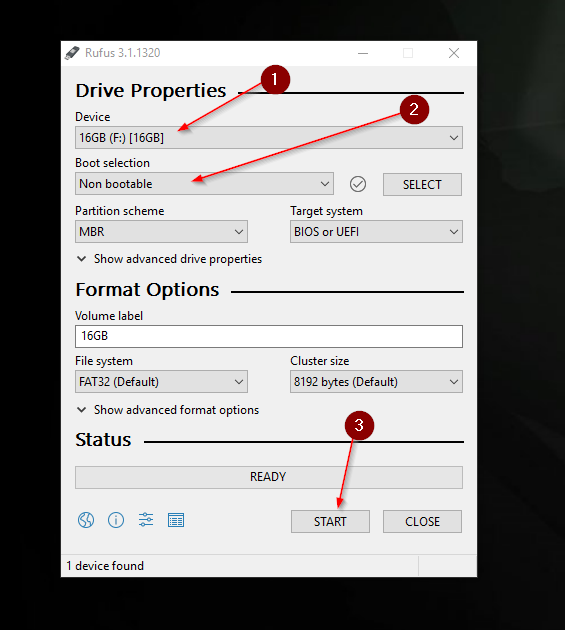 There is a way to Repair a USB Stick on Windows 10 using a tool called Rufus. Because I have to create quite a good amount of Bootable USB Drives in my profession, I produced a good amount of broken USB Drives and had to find a quick & easy way on how to repair them. I will show you the easiest way on how to Repair a USB Stick on Windows 10. We are going to use a tool called Rufus. You can download it here. Rufus is free, regularly updated and Open Source. After downloading Rufus, go ahead and start it. Now, my broken USB Drive doesn’t even show up in the Windows Explorer anymore. As you can see in the Screenshot below, it’s totally messed up and has 4 Partitions on it. But even that Windows is not recognizing it, Rufus does, as you can see in the Screenshot below as well. To Repair the USB Drive, make sure again that the correct Device is selected. Then, for Boot Selection choose: Non bootable. Leave everything else on Default or as in the Screenshot below. Click on Start. Confirm both warnings with Yes & OK.
A couple of seconds later you should have a perfectly working & correct sized USB Drive at your disposal again. This is by far the easiest way on how to Repair a USB Stick on Windows 10 I have found so far. If you are like me and messing up USB Drives day in day out, you will be happy to have a quick solution like this available to you. ← Install Jupyterlab on Ubuntu 18.04: Fast & Easy 2019!